Dave Grohl and the boys will headline the Pyramid Stage on Friday, using a video message at the NME Awards to announce the show. The rumours have swirled for months, but now it's been confirmed: Foo Fighters will headline Glastonbury 2015. 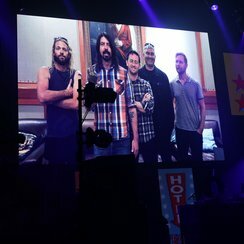 In a video message at the NME Awards last night (18 February), Dave Grohl accepted the band's Best International Band prize via video message. He also took the opportunity to announce that the band had another big gig to add to their summer line-up of shows. "We're very thankful and very happy - sorry we couldn't make it tonight, but we will be seeing you over the summer at some big outdoor festival that nobody knows we're playing. It's Glastonbury. "So we'll see you at Glastonbury - thanks a lot everybody." The Glastonbury website has since confirmed that the band will top the bill on Friday night. It's the first time the band has played Worthy Farm since 1998. 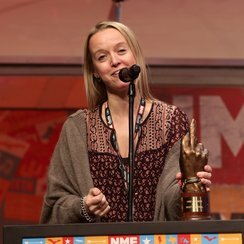 Sunta Templeton spoke to Emily Eavis about how excited festival organisers were to have the band onboard. Emily said they "feel incredibly lucky" to have signed the band up. "Very few bands have the power to unite and energise a crowd like Foo Fighters do. We can’t wait for them to rock Worthy Farm on Friday night." 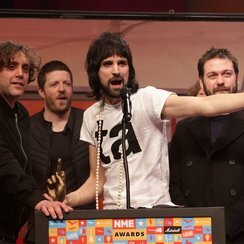 Also winning NME Awards last night were Kasabian, who went home with Best British Band, Best Album for 48:13 and "Best Quote". Jamie T was awarded Best Track and Best Video for Zombie along with Music Moment Of The Year for his comeback, which was presented by Florence Welch. Jake Bugg won Best Solo Artist and Suede were given the Godlike Genius Award.